The problem I'm having trouble with is how to extend the inner tubing. I want to put a pully at the top of the outer tube, and have room to drop a cable down the outside length of the inner tube. I was thinking I could cut a slot down the length of the inner tube, or most of it anyway, and weld in a stick of angle to give clearence for the cable while the tubing was nestled. I've got a plasma cutter and a mig, but not much experience with welding something this long. I'm thinking it might warp pretty bad. I plan on tacking on one end and then the other, kind of spread it out, but don't really have a clue what this tube will do after welding 16-18' on one side. Anyone have advice or other options? A few things to consider with this set -up. The 2 1/2" tube will have to be special order DOM so there is no flash on the inside. As part of the forming process tension in the metal will cause the tube to spring open slightly when cut lenght wise. Many people have found that if a 2" receiver hitch is left in place for an extended time it can be very difficult to remove. How about using a piece of unistrut channel for the upper (inner) piece? Or you could use it for the bottom on the outside. Either way, it'd be easy to then rig a raising pulley and rope and you'd have clearance for the seams and the rope. Or use round tube inside square tube. Last edited by usmcpop; 04-15-2009, 09:15 AM. You wouldn't have to cut the tube, weld a couple of pieces of angle or a single channel piece to the small tube. Find a rectangular tube to fit it into. 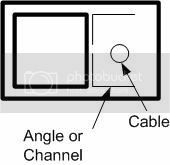 The cable would be attached to a tab welded near the bottom of the inner tube and a pully would be mounted near the top of the rectangle so that it was tangent to the cable. I think this could work with standard tubeing, especially if the welded seam on the rectangle is on one of the narrow sides. I would think that a piece of unistrut or any open-sided form would be subject to folding over by a strong wind. I would expect about 16' extended above the lower piece? I like the idea of using a piece of channel inside to give the cable a place to reside. You could also just weld a piece at the bottom of the inner channel to make it bigger and a piece at the top to make the hole smaller so that you only have to weld at the end of each tube. That is an improvement to my suggestion, uses less material. You could put a peice of angle accross the rectangle at top so there is more baring area than the plate, but I think you have winner there. And Ferntj has a good point about spreading out the load over a larger area. Last edited by whateg0; 04-15-2009, 01:31 PM. Not that it matters regarding mast construction but are you going to hang a ham antenna,cb antenna or ?? As part of the forming process tension in the metal will cause the tube to spring open slightly when cut lenght wise. I never really thought about that. It would take a lot of clamps. I know most receiver hitches are made with special 2.53x0.25 square - $$$. Going into 0.188 gives a little more slop. I like the retangular tubing idea for the lower. I could probably just weld on a couple small pieces of 3/8 plate about 4' from the bottom and strap it at the top, like your pic. This would give me a stop, (which is something else I was trying to figure.) I wish they made 3x2 1/2 rectangular. I see there's a 3 1/2 x2 1/2, not sure how common that is. Or, if you cared, you could center it by putting a spacer on 4 sides. Think I'll run with this and look at 2" into 3", or maybe even round stock. As long as I have a level positive stop, a little slop won't hurt anything and having a channel on the outside would mean less friction with the outer tube. I plan on mounting a rotator with thrust bearing at the top for various homebuilt ham antennas. No major beams - this wouldn't hold up, but it's perfect for lightweight fiberglass and wire. The only place in the yard I can put this, and still stay married, is the one place it'll need to both telescope and fold. Thanks for all the great ideas, guys! Getting the round stock to telescope and still fit a cable in there will present the same issues as the square or rectangular. I don't know how much slop you consider to be a little, but a little slop can be a big pain if the thing is swaying in the wind. Even if you do put the stop at the 4' mark, or wherever, you still need to have something at the bottom if the tubes are not tight (which if you are able to put a stop in, they probably aren't). I think you want the fit to be pretty tight but still allow it to freely move up and down. I'm not familiar with how you mean to mount this mast, but if you are using 20' each of 3x3x1/4 tubing and 2x2x1/4 tubing, this is going to weigh over 285#. Just something to think about. I probably won't need 1/4" wall. It's still going to be heavy, but the foundation will be 6' deep and it'll have a winch to do the work. The nice thing about having the telescope is I can drop it low when not being used. I've seen flagpoles welded up out of sch. 40 pipe like this - the weight isn't much different, I'll just have a winch, pulleys, cables, pins, friction and back pain to deal with. I would say open up the yellow pages and find the nearest Hertz Rental, United Rental, or any other construction equipment rental yard and call to see if any have portable light towers (trailer mounted generator with a retractable light mast). If they do, ask if you can look at them. Those towers are usually two to five sections of aluminum or steel square tube that is raised by a hand operated crank winch, pulleys, and steel cable. Any way you go, please post pics--I am looking for a mast I can slip into my 2" receiver on my truck for a hamm antenna and SAR operations comm gear. Last edited by teck_man12; 04-16-2009, 02:19 AM. That one man tower looks interesting. I can't see what the trolley uses to slide on. Maybe it's just metel on metal. Looks very heavy. Here's where I got my idea. Looking at it again, it appears to use square inside rectangular. They must have few code restrictions over there. Something like this could probably be adapted for a receiver hitch. I've got a ladder rack on my truck that could be modified. It would be a quick field day tower - you could be up and running before the other guys get their tower sections unloaded. Check out Rohn Towers (a google search should do it). The make folding and telescoping towers. My experience with them was that I could buy their 48' Heavy Duty Self Supporting (no guys) for considerably less than what I could fabricate one for.